☞ Whatever brand storytelling is, it is clear that it is more than just a minimalist approach to storytelling, where narratives are merely defined in terms of a stringing of events. The more traditional conception of narrative, with interesting plots, characters and even heroes, is at work here. The approach in brand storytelling is also qualitative, where value judgments are passed on what makes a good or effective narrative: not every story would do the job. This article looks at the hero. One difference from the traditional hero however, is that the hero of a brand story may not necessarily be anthropomorphic, but could very well be the brand itself. Thematically, the brand story should also involve a big idea which promises to improve the lot of everyone who makes use of the brand. “At the center of every brand story is a hero. The hero could be an idea, a person, or a thing– to be effective at brand storytelling, it’s critical to know what attributes define the inner character of the hero. The hero, of course, is the brand itself. Like any good story that teaches and informs us about a higher ideal, brand storytelling is about the higher purpose of why the hero exists and why we should care. The notion of brand storytelling is one that is growing in popularity among marketers these days. Yet so much “storytelling” continues to be nothing more than outbound messaging and selling. That’s no surprise because it’s the job of every marketer to message and sell. If you’re not selling something, then you’re not marketing right? For this reason it’s in the marketer’s self interest to “message” out directly, rather than engage people in the ideas and lessons they care about. Every enduring story is based on a transcendent idea bigger than the story itself. The elements of any story – characters, plot, and environment – can clarify, focus, and influence the idea’s expression, but it’s always the big idea that drives the brand story. The hero of the story is the character who possesses the big idea. And the heart of that idea “teaches us to improve our condition”. And it’s our “condition” we care most about! Creating value is about improving the condition of people’s lives. From the dawn of language, stories have taught humans how to improve the conditions of life. ☞ Should racing games have stories? Why? Shouldn’t they be storyless and plotless instead? As this blogger explains, there are advantages to having narratives in racing games… not merely narratives, one should add, but well-told (or well-designed?) ones. “Why are there no racing games with stories? 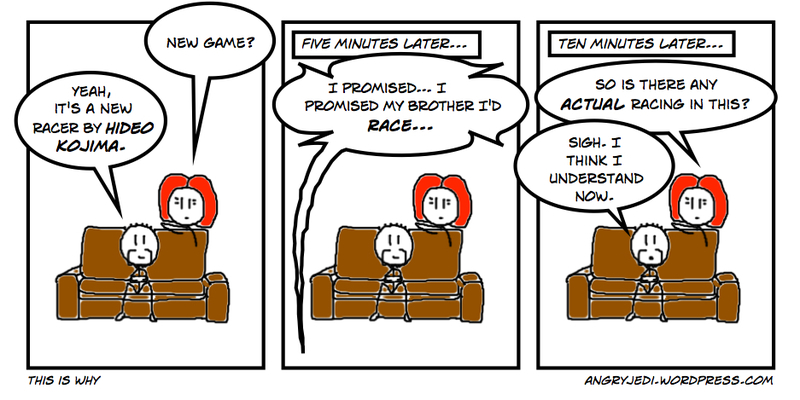 No, wait, scratch that, why are there no racing games with good stories? Or at the very least well-told stories? It is surely not a difficult thing to do. You take the basic game structure from Wing Commander and replace all the space combat with racing cars around tracks and/or city streets. Then you profit. Why has no-one done this? The few racing games out there that do have storylines of sort are generally half-assed efforts where all the plot is delivered through badly-written text put into the game as an afterthought, or they simply don’t carry their potential through far enough. Some are too imprisoned by narrative and plot that they risk predictability. ☞ Fantasy narratives do not simply arise from the creation of an inchoate fictional universe. The writer has to concretise the universe in order to create a coherent and convincing narrative. One of the ways that this could be done is through the drawing of reliable maps. In this article, Tegan Beechey does a marvelous job of illustrating how this could be achieved. “A good map is, I’d venture to say, just as vital to you as it is to your characters; you need a map to know the size of the world they occupy, the length of their journey, its difficulty, and distance. Furthermore, a good map serves as an important tool for your readers as well. It can give them perspective in a completely foreign world, offer subtle clues to the history and culture of your creation, and create mystery and the promise of adventure. Making a good map is not as simple as purchasing good design tools or the appropriate number of ink pens. Making a good map is a process of thought with clear stages. Each stage can be viewed as an important step in framing your world as well as in mapmaking. By making a map early in the writing process, authors can create a sense of time, place, scope, and scale, and allow this vision to color their writing. ☞ Choices may be a factor in our response to narrative. But these choices are in a way determined by the writer or the producer of the narrative. Are video games different? Are the choices in a game authentic or are they actually illusory? “…the choices given to the player are almost always an illusion to make it seem like they matter. But what makes them matter is not that they are there, but that they allow the player to feel the impact of these moments through the story. It is within choosing the Stormcloaks over the Imperials, in curing the Genophage over tricking the Krogan, in saving Doug or Carley, where the narrative takes shape depending upon our choices. But because of this seeming betrayal of trust in the audience to distinguish the two styles, the theme of choice have become a pariah of sorts thanks to this perceived notion of railroading storylines. In actuality, that is nothing new or against the mechanical design of the choices given in video games. For story-driven games, the choices will always be tied to a plot written by the developers, but controlled by the players. The real value of this is not that the story eventually doesn’t matter, but that the journey the story takes, the changes in the narrative because of how the player controls the story, will make the experience worthwhile. It is a gamble each time, and this past year we have seen many games succumb to the wrath of players because the plot ended a certain way. Ultimately, we need to take to heart the fact that in the end there are no true consequences, no fully changed outcomes to be gained in a fixed plot. But there are consequences in the choices made because of our attachment to them, to the characters and the often moral implications of their predicaments, that allow us to shape the eventual narrative we experience. It is through this illusion of choice where we see the crux of the narrative that gamers become attached to, and in the end the choices matter only because we made them that way. We control the illusion by making the choices, which in turn help us tell the story, the emotional meat of the experience.